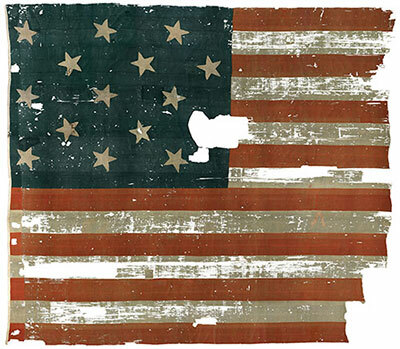 The nation's flag, which underwent an 8-year conservation period from 1998 to 2006, is today the centerpiece of the museum. Soaring above the entrance to the gallery is an architectural representation of a waving flag—approximately 40 feet long and up to 19 feet high and composed of 960 reflective tiles made of polycarbonate material. An introductory section in the entry corridor sets the scene for the Battle of Baltimore during the War of 1812. Around the corner, the 30-by-34-foot wool-and-cotton flag is on view in a new dramatic display behind a 35-foot-long, floor-to-ceiling glass wall in a climate-controlled gallery that re-creates the dawn's early light, similar to Francis Scott Key's experience the morning of September 14, 1814, when he saw the flag flying over Ft. McHenry in Baltimore Harbor, inspiring him to pen the famous lyrics. The first stanza of the national anthem is projected prominently on the wall above the flag. Sections in the exit corridor trace the flag's history, including its safekeeping by Major George Armistead and his descendants, the Smithsonian's efforts to preserve it for more than 100 years, and how both the flag and the national anthem have come to represent diverse ideas of patriotism and national identity. Also at the exit is a tactile panel with an outline of the flag and a full-size star for visitors who are visually impaired.